Thursday, Feb. 4 is World Cancer Day, an initiative by the Union for International Cancer Control (UICC) to raise awareness about cancer and entice people and government organizations alike to take action against it. “On this World Cancer Day, we are proud to join people across the globe in raising public understanding of cancer and the importance of cancer research to conquering cancer and improving public health,” said Margaret Foti, PhD, MD (hc), chief executive officer of the American Association for Cancer Research (AACR), in her statement on World Cancer Day. The AACR is an active member of the UICC, which unites the world’s major cancer societies, ministries of health, research institutes, and patient groups. A recent report on global trends in cancer, published in December in Cancer Epidemiology, Biomarkers & Prevention, a journal of the AACR, offered an interesting window into the way cancer affects various global populations. The study’s lead author, Lindsey A. Torre, MSPH, an epidemiologist with the American Cancer Society, said that in general, the study showed cancer incidence rates continue to be the highest in many high-income countries (HICs). While the death rates are declining in HICs, they are increasing in low- and middle-income countries (LMICs). HICs are benefiting from better screening and detection efforts, as well as a reduction in smoking. However, LMICs are suffering as their populations adopt risk factors that were once more typical of HICs, such as smoking, gaining excess weight, and being less physically active, Torre explained in a press release. Torre and colleagues analyzed cancer incidence and mortality data from 50 countries representing various regions of the world, using the International Agency for Research on Cancer (IARC) CancerMondial database, which includes incidence data from Cancer Incidence in Five Continents, a collaboration between the IARC and the International Association of Cancer Registries, and mortality data from the WHO Cancer Mortality database. Gender differences. Among women, breast cancer is the leading cause of cancer-related death worldwide. 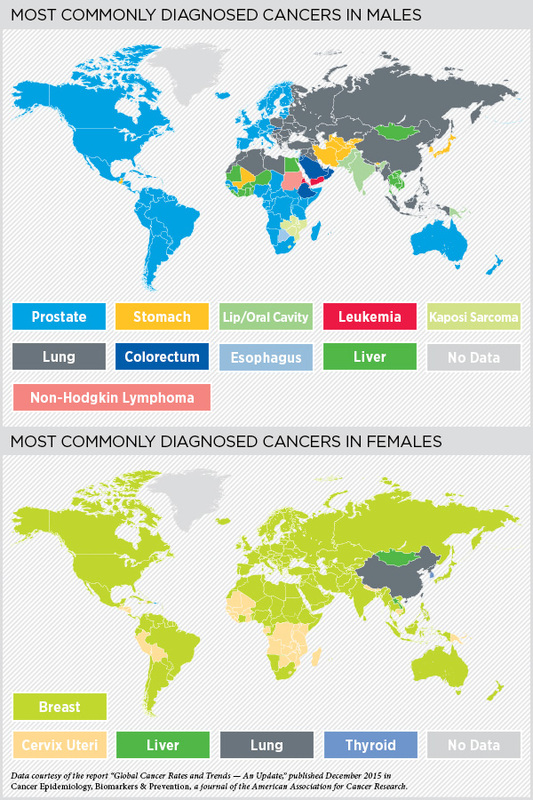 Breast and cervical cancers are the most common cancers in most countries, while lung, liver, and thyroid cancers are also commonly diagnosed in Asia. Among men, cancer takes a more diverse profile: Prostate cancer is the most frequently diagnosed cancer in 87 countries, and lung cancer is the most commonly diagnosed cancer in Eastern Europe. 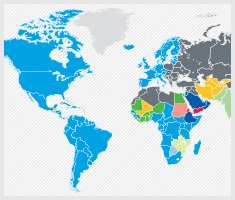 In Africa and Asia, the leading cancers are colorectal, liver, esophageal, stomach, lip, and oral cancers, Kaposi sarcoma, leukemia, and non-Hodgkin lymphoma. The outliers. In a few cases, countries posted unusually high rates of certain cancers, sometimes creating a puzzle for researchers. For example, the area from northern Iran through the Central Asian republics to north-central China forms what researchers call the “esophageal cancer belt.” In these countries tobacco and alcohol use (both risk factors) are low, but the report suggested that poor nutrition and the consumption of beverages at very high temperatures could play a role. Liver cancer is unusually common in Asia – the report noted that about 50 percent of the world’s liver cancer cases and deaths occur in China alone. Hepatitis is one cause, but there are some unusual environmental factors as well. The study cited aflatoxin, a toxin produced by a fungus that can infest stores grains, peanuts, soybeans, and corn; and infection with liver flukes, a parasite that is most commonly found in Thailand. The AACR has increased its international initiatives in recent years, reflecting the global diversity of our members, who reside in 104 countries. The AACR opened an office in Shanghai in 2014 and one in Toronto in 2015. In the next five years, the AACR plans to hold educational workshops in China and Latin America, and will fund international training and exchange programs. “It is only by fostering global sharing of ideas and data that we can bring innovative interventions and proven treatments to people around the world,” Foti said in her statement on World Cancer Day.